This is not just any knot, however. 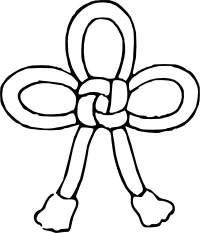 This knot is called “agemaki” (総角) and auspiciously symbolizes the four directions. It is hung above sumo rings, and was used on samurai armor both for decoration and as a structural component. (Samurai Weapons) For these reasons and its graphical simplicity, it makes a lot of sense as a samurai mon. Slightly more stylized depictions continue to be used in mon today,(Kamon Composition Maker) albeit rarely. This entry was posted by Kihō on November 28, 2010 (a Tomobiki (友引)) at 7:13 pm, and is filled under Mon. Follow any responses to this post through RSS 2.0. You can leave a response or trackback from your own site.